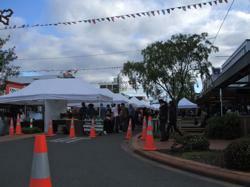 Rotorua Markets - It doesn't matter where in the world you are, markets are fun places to visit. In Rotorua we have a number of them and, like all markets, you never know what treasures can be found. Poke around amongst the new and used and while you're at it, check out unique NZ arts and crafts, antiques, curios, clothes, books and yummy locally made food. 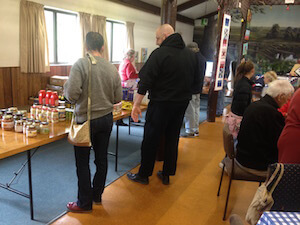 Every Saturday morning no matter what the weather, the Kuirau Park Flea Market is held. Run by the Rotary Club of Rotorua North, the proceeds of the stall fees are donated to various local charities and projects. It's become an attraction in itself with both locals and visitors heading there for breakfast. Look for freshly made food such as rewena (māori) bread along with other māori foods. You will have to try these if you're from overseas. Ciabatta (a local artisan bakery) has a presence at the market as do other stalls featuring foods of India, Asia, and Latin America. Jewellery, second-hand pots and pans, clothing and fresh fruit and vegetables are also available. I couldn't believe my eyes recently when I saw a busload of Asian tourists getting dropped off at the flea market. I wonder if it was on their itinerary or whether their tour operator wanted to give them some authentic local flavour? Whatever the reason I think it's great for the visitor to be able to mix and mingle with locals. Since then I have seen it happen again so it's not just a one-off. 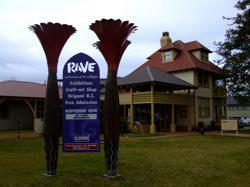 If you are going to be visiting the flea market you may like to have a look at further information about Kuirau Park. It's a great place to have a wander through the geothermal areas and gardens. Where: Kuirau Park off Ranolf St. See google map further down. 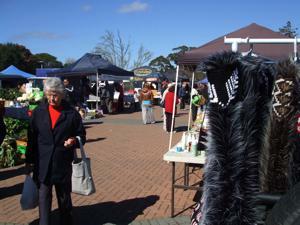 The Rotorua Night Market is a more high-end type of market selling locally made products. Examples include artisan cheeses and pasta, coffee and wine, alpaca scarves and wraps, olive oils, mussell fritters (yuuummy), plus more. The surrounding shops stay open which adds to the ambience of the evening. You can spend a lovely hour or two just browsing and enjoying the atmosphere at this market. Where - On Tutanekai St (actually on the street as it gets closed off) between Pukuatua and Haupapa Sts. Also check it out on the google map below. 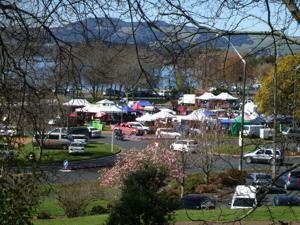 This is the largest of the Rotorua markets, held at the Lakefront. Leading up to Christmas and on long weekends it gets packed. There are hand-made products such as knitting, wood carvings, soap, jewellery, stone carvings etc. Stalls also carry parallel imported products, second-hand books, antiques, plants, the list is endless. You name it they got it. Where: Lakefront, north end of Tutanekai St. The Sulphur City Arts 'n' Crafts Market features crafters and artists selling unique NZ handmade products with no parallel importers allowed. The crafters and artists come not only from Rotorua but also around the Bay of Plenty and I tell you what, there are some beautiful things for sale. Oddest stall I've seen? The Coffin Club. Yep, you read right. Somebody from the University of the Third Age, a club for retired and semi-retired locals, came up with the idea of people making their own coffins. The materials are cheap compared to traditional coffins. For the most part it's about personalisation. One I saw had the owner's name on it. She had also painted flowers and greenery all over finishing off with a lovely poem. In the meantime the coffin can be used as... ummm, a coffee table... a bookcase... whatever a person can dream up. Fun huh? At least you can't say that Rotorua markets are boring. The venue for this market is our local Arts Village. It's a place locals get to try their hand at pottery, photography, writing and other crafty hobbies. The Village Craft Shop has lots of cool things for sale and a gallery with exhibitions. These are both open on market days alongside a kitchen where refreshments are made available. Saturday markets are a great way to spend a few hours for relaxation so make sure to visit this one. When - Every 1st Sunday of the month. Where - 1240 Hinemaru St.
Usually held on one Saturday or Sunday of every second month beginning in January, the Dutch Market is becoming very popular. So popular people are coming in from out of district. It features? Everything Dutch of course. Delicious traditional Dutch food specialties include salted herrings, croquettes or Oliebollen. Then there's the smoked eel you can buy frozen for later, or fresh to eat right away in a slice of bread. While you're at it, check out the art, plants, staple food items and carved wooden dishes. Tables and chairs are handily arranged so grab yourself a coffee, a seat and find out more about the Dutch way of life. NB: Cash only as there are no eft-pos facilities. Where: Dutch Club Bldg. Neil Hunt Park, turn left off Tarawera Rd (just past Outdoorsman Headquarters). Use the google map for directions to all the Rotorua markets. As you can see they are all within a small area. There is plenty of parking for all the markets although it can get busy. For the Night Market, it is held outside office hours so you don't have to worry about the parking meters. Toilets are available near all the markets, just ask stallholders or people who look like locals to get pointed in the right direction. Interested in more shopping opportunities? Take a look at our Second Hand Shops or Souvenir Shops, Supermarkets or the Rotorua Mall.